Here is this years selection, some of the descriptions are vague as we have been given the chillis or swapped with people, as usual we grow some in the ground as large bushes in the greenhouse and some will be kept as pot plants but still in the greenhouse or the kitchen windowsill. There is also a selection where we have an abundance of seed so we can grow to sell small plant on in spring at the markets we attend. 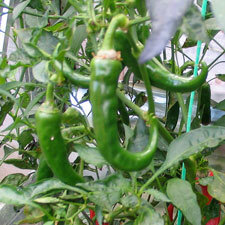 Ancho: Mexican classic grown for cooking, bell shaped green to deep red/brown. Charleston Hot: Very hot curved 10cm fruits, green, yellow and orange fruit (no germination). 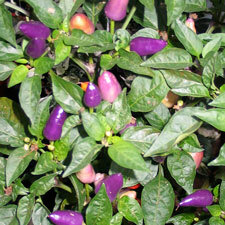 Fatalii: Habanero relative, bright yellow fruits, hot and early. 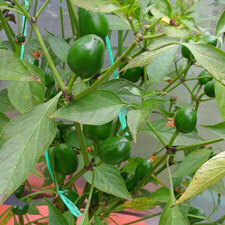 Fiesta: Ornamental, mass of multi coloured upright green/ orange and red fruits. 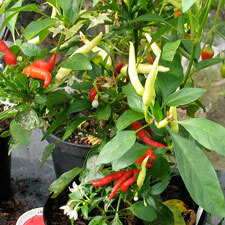 Jamaican Hot: Hot red hat shaped chillis (germinated but poor growth in spring). 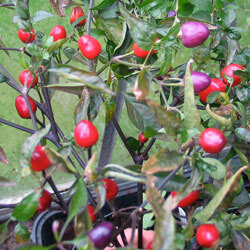 Filius Blue: Striking ornamental, violet coloured leaves with cherry sized purple fruit. 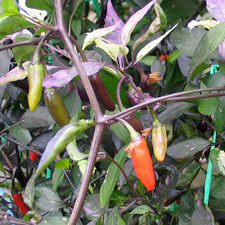 Orozco: Tall plant, purple stem and leaf, small hot fruits purple to orange. Purple Peru: (Swapped Seeds) Unknown as yet. 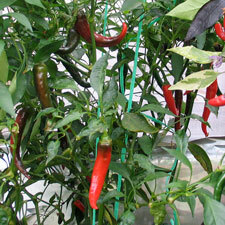 Ring of Fire: Hot 8cm long tapered chillis, ripening green to red. 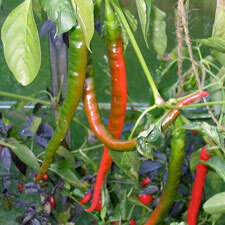 Joe's Long Cayenne: Long 20cm crinkly red chilli, medium heat. Greenhouse Sensation NFT Hydro System GS100 3 plant, it constantly pumps a stream of water and nutrients to the plant roots and provides unrestricted access to oxygen. 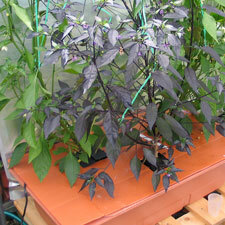 The nutrients for the NFT include all the elements plants need for healthy growth. The planter reservoir is completely emptied and refilled every 3 or 4 weeks, so no elements are ever too depleted or too concentrated. (Now called the Vivigrow 3 Plant Kit). 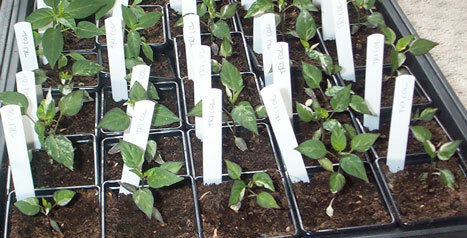 April : All plants are now potted on into 5cm pots and well labelled up. Have been moved into the greenhouse although there is still a slight chance of morning frosts, but they do need hardening off from being in our lounge. 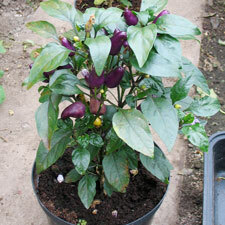 They will now have a bit more time in the pots before planting into the ground or into their final large pot. Three plants will also be chosen to try out a soiless growing method. May 2 : All plants are now are now in the greenhouse with some planted straight into the ground. Hydroponic system (left) is now running with Ring of Fire, Unknown and Orozco growing, hoping to speed up cropping of a couple of these slower growers. These 3 were placed into the system with a good root showing in a 5cm pot. A few others this year didn't germinate, namely the Charleston Hot which was a bought fresh seed packet and the Giant Jalapeno which were saved seeds from last years crop, but then again Aurora did germinate this time but didn't last year, from same seed batch. May 16 : Two weeks on and the plants in the hydroponic system have their roots growing out into the solution along the tray and are looking healthy. A slight topping up of the nutrient solution and a pH check has now been performed with a constant flow temperature of 23°C. More info on this system click here Checking the other plants in the 5cm pots more regularly now as they are drying out quickly on the warmer days, and will be potting them on into a final size of about 20cm when big enough. 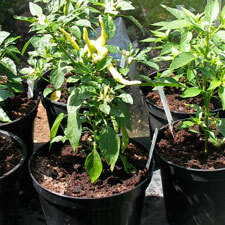 June 6 : Potting on into 20 cm pots for most of them which are from March/April sowings. The small plants Rooster Spur, Chinese 5 Colour & Candlelight are from a May sowing, these had higher germination percentage and are catching up fast with the early March sowings. They also look healthier and are less prone to damping off and disease. 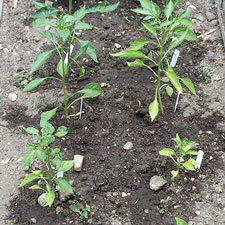 July 1 : The ground plants now starting to produce with fruits on the Ancho and the Joe's Long Cayenne. Pots plants are nearly all in flower, some with good sized fruit on. The taller ones in the pots are now needing a stake to keep them upright. July 3 : The hydroponic plants have now had their 3rd complete tank nutrient change with pH being checked and are growing well, now needing support to hold upright. 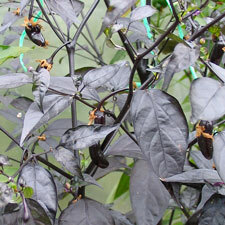 The Unknown has quite a few fruits on while Ring of Fire and Orozco are in full flower with small fruits appearing. The nutrient tank now needs regular checking for topping up. 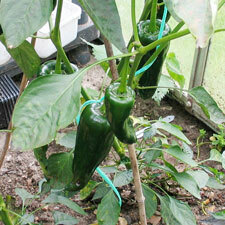 July 22 : Ancho's are doing well and have now started picking a few to eat as they are good stuffed and baked. 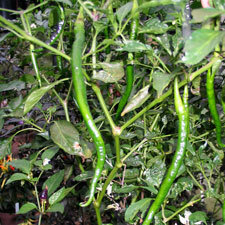 Joe's Long Cayenne isn't doing that well but have taken a few long curly chillis of it, but have since removed the plant as it was weak and prone to disease. 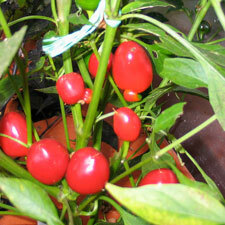 The Fiestas now are now starting to ripen with the plant being only 40cm high it makes an ideal kitchen windowsill plant. 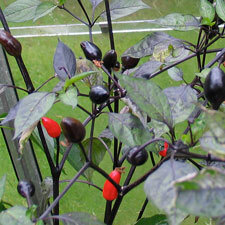 Filius Blue is about 100cm high in a pot and is full of glossy purple chillis. 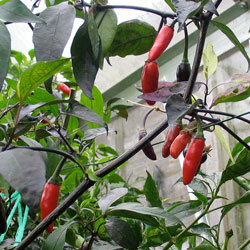 Aug 19 : We have had a bit of a recovery on some of the poorer growing plants, the two remaining Joe's Long Cayenne plants have suddenly produced these amazing 30cm long chillis. The Fatalii is now producing fruit. The Ancho's are now being picked for eating with a few for sale on our Farmers Market Stalls, along with anything else which is ripening, mainly the unknown which has a good ripe crop on. 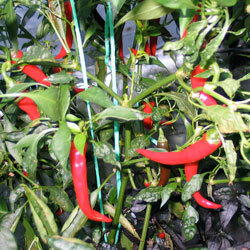 Aug 22 : All three plants in the hydroponic system are doing well with good vigorous growth and are full of chillis, the nutrient solution needs topping up every 2-3 days. The unknown's are turning red and needs picking, the Ring of Fire just needs to ripen along with the Orozco. All the plants need support now to hold them up so they've been strung up to help them. Oct 14 : The Joe's Long Cayenne is now heavy with fruit and needs tying to keep it up, most of them are now ripening as the days are now getting short and colder. The Ancho's have all been picked. The Ring of Fire, Unknown, and Orozco are still doing well in the hydroponic system and needing tying up due to the weight of fruit on all the plants. Oct 24 : Just about the end now for an unheated greenhouse. Final pick in the next 2 weeks then clear out and clean up for next year. For the chefs out there a quick picture of the Tomatillo's. We had 2 varieties, purple and green, both done well as usual but it does take over wherever you plant, as they will reach up to 7 feet high and 3 feet wide sprawling everywhere. The ripe ones can been seen busting out of there husk. That's it for another year, the hydroponic system done well especially in the start of the season to get them going quicker, also had the advantage of only needing topping up every few days in the middle of the season which is a benefit if you are going away for a few days. The Ring of Fire and Unknown were probably the better of the 3 plants tried, as the Orozco's fruit was a bit small, alright for looking at but not eating, so next year a wax type or Serrano may be tried. Best of the others was the Fatalii as it had a good flavour similar to the Naga and also good heat, ripening a bit earlier than a Habanero type. The Rooster Spur grown for the markets sold quickly as they were incredibly hot for such a small little fruit, as we found out when someone bit into one on our stall.